Yamaha has changed the face of dirt bike history numerous times over the last 40 years. From the first ‘monoshock’ motocrossers of the seventies to leading the four-stroke motocross revolution in 1997, Yamaha dirt bikes have constantly been at the leading edge of innovation. Yamaha was founded in 1887 by Torakusu Yamaha as a piano and Reed Organ Manufacturer. The company’s musical instrument heritage is still reflected today with the logo of three interlocking tuning forks. The three tuning forks represent the three pillars of business – technology, production and sales. After World War 2 company president Genichi Kawakami repurposed the production machinery for the manufacture of motorcycles. 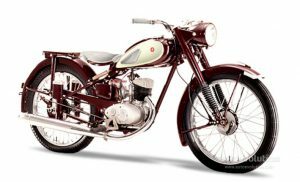 In 1954 the first production motorcycle, the YA-1 was launched. 125 were built. It was a 125cc single cylinder two-stroke, patterned on the German DKW RT125. The success of the YA-1 led to the founding of Yamaha Motor Co. Ltd in 1955. 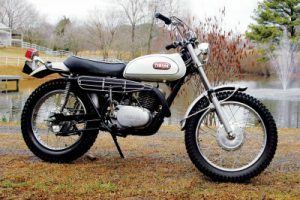 In 1968 Yamaha’s first dirt bike was produced, the DT-1, a two-stroke 250cc trail bike. It was hugely successful. 1975 was the year Yamaha released the first production model motocross bike with the ‘monoshock’ single rear suspension setup. 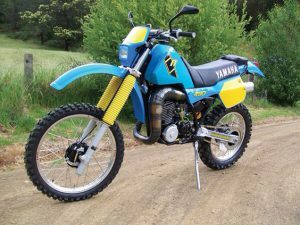 In 1976 Yamaha produced another first, the introduction of the air forks with the YZ125X. It was not hugely successful, and by the following year returned to conventional forks. The late seventies also saw the introduction of the first Japanese two-stroke enduro bikes, the IT series, which led the swing away from the more expensive European competition enduro bikes. 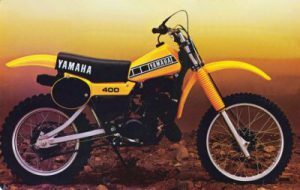 The first big-bore four stroke trail bikes were also appearing with the Yamaha TT and XT500 thumpers. Heavily modified versions were having competition success, like the HL500. A prototype built by Swedish MX world champions Torsten Hallman and Sten Lundin was made famous by Bengt Aberg in the 1977 Swedish 500cc GP series. His success lead to Yamaha producing a limited run of production HL500s, which boosted sales of the TT/XT500 trail bikes. 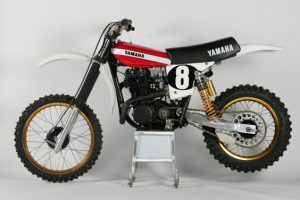 In 1981 Yamaha released the first water-cooled motocross bike to the mass market with the YZ125H and YZ250H. 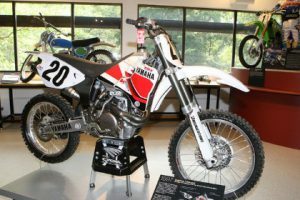 In 1996 the AMA changed the rules of Motocross racing to allow a 450cc four-stroke machine to compete in the same class as the 250cc two-stroke. This changed things forever in the MX scene and led to the first victory of a four-stroke bike in an AMA Supercross event in Las Vegas in 1997 by Doug Henry on a Yamaha YZM400F. In 1998 Yamaha released the YZ400F to the public. 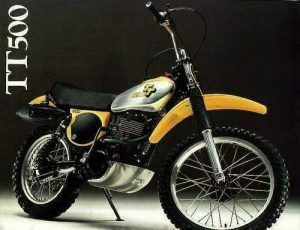 It was the first mass-produced four-stroke motocross bike. Yamaha is one of the ‘Big Four’ Japanese manufacturers alongside Suzuki, Honda, and Kawasaki, and has always been an innovator. They have changed the color of their dirt bikes numerous times – yellow/Black, white, Blue. When you compare today’s enduro and motocross bikes to the first DT1 trail bikes of 1968, the advancement in technology is incredible. The tuning fork company has come a long way. “King” Kenny Roberts was born in Modesto, California on December 31, 1951. He was the first American to win a Grand Prix motorcycle world championship in 1978. He was also twice winner of the AMA Grand National Championship. 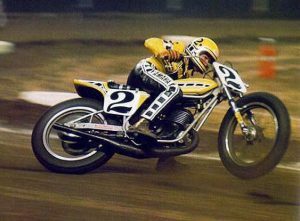 Roberts has also won the AMA Grand Slam, having Grand National wins in the mile, half-mile, short-track, TT Steeplechase and road race events, one of only four riders in AMA history to do so. In 1990 he was inducted into the Motorsports Hall of Fame of America. In 1992 he was inducted into the International Motorsports Hall of Fame. In 1998 he was inducted into the AMA Motorcycle Hall of Fame. In 2000 the FIM named him Grand Prix “Legend”. Bob “Hurricane” Hannah was born in Lancaster, California on September 26, 1956. 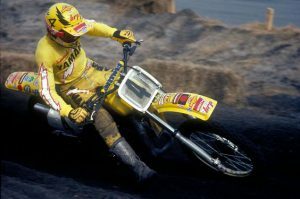 He is one of the most successful motocross racers in American history, having won a total of seven AMA National championships. He won a record eight consecutive 250cc outdoor national titles. In his 15 year career, he had become the all-time win leader in AMA motocross/supercross history, winning 70 national titles during his career. Jeremy McGrath would break that record in 1999. In 2000 he was inducted into the Motorsports Hall of Fame of America. Since retiring from his motocross career he competed in the sport of airplane racing and has been running a sport aviation sales company, and a winery. 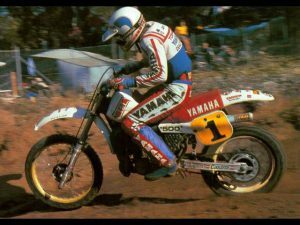 Stephen Gall is a true legend of Australian motocross, and since bursting onto the Australian motocross scene in the 70s has always remained loyal to Yamaha. He set new standards in professionalism, fitness, skill, and versatility. Back in the late 1970’s, the glory days of Australian motocross, Stephen Gall and Anthony Gunter had a stranglehold on the Mister Motocross series. It was Suzuki vs Yamaha – Gunter vs Gall. The Mister Motocross series ran from 1974 to 1990 and was the pinnacle of Australian Motocross at the time. Stephen Gall emerged as the winner in 1978, 1980, 1981 & 1982. In 2016 he was inducted into the Australian Motor Sport Hall of Fame. In 1978 he founded the Academy of Off Road Riding, helping train up and coming riders. In 1988 Stephen founded Gall Bros. Medical, which markets CTI knee and wrist braces used by many top riders, but also used for a wide range of sports and activities. Stephen was in charge of the motorcycle stunts in the 2015 movie ‘Mad Max Fury Road’ and at age 59 was one of the stunt riders too! When you look back over the last 40 years of Yamaha dirt bike history, it’s easy to see why Yamaha has become one of the world’s leading manufacturers. I can’t wait to see what the future holds. Do you have a favorite Yamaha? Have you have owned one of the legendary Yamaha models mentioned in this post, please feel free to share your story in the comments below. The evolution of the yamaha dirt bike is awesome.I have a yamaha DT125 bike.Model year is 2001.Fuel consumption is very good.It has a powerful engine which can go on any mountain. So I know yamaha bikes are better than others.your presentation is very good and useful for bike riders.Thank you. Hi Kasun, thanks for your comments. The DT125 is a great bike. The Yamahas are so reliable and the DT series as you know is the bike that started the whole dirt bike movement, the very first DT1 released in 1968. I remember one of my friends buying one. Glad you enjoyed the post.